We have a limited number of alpaca skins. The hair is between 3" and 4" long. For a close up view of the hair, click HERE. The skins are rougher than what we are hoping to get in the future. The tanning on the hide side is fairly rough. Nonetheless, these make ideal rugs in the right environment. Our Gxx codes denote individual pieces. 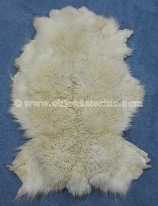 If you would like to order a specific alpaca skin, please go to our Gallery to pick the exact one shown. Genus and species: Vicugna pacos. Ranch. Alpaca are not an endangered species. The animals have not been killed just for the hide.